"Isaiah 8:20 , Matthew 5:17 - 20 , Rev 15 :1-4 Really enjoyed this work. The ending was a pleasant surprise. Thanks again." First, what does "Abomination of Desolation" mean? 1.anything abominable; anything greatly disliked or abhorred. 3.a vile, shameful, or detestable action, condition, habit, etc. 4. having the feeling of being abandoned by friends or by hope; forlorn. 5. dreary; dismal; gloomy: verb (used with object), desolated, desolating. 6. to lay waste; devastate. 7. to deprive of inhabitants; depopulate. Daniel 9:24 states: "Seventy weeks are determined For your people and for your holy city, To finish the transgression, To make an end of sins, To make reconciliation for iniquity, To bring in everlasting righteousness, To seal up vision and prophecy, and to annoint the most holy place." "The city of Jerusalem captured by the Romans in the year A.D. 56. At that time, the Second Temple of Jerusalem was also destroyed. The error of 14 years in the dating of this event comes mainly from two sources. First, the death of Augustus Caesar has been misdated by historians and chronologists. Augustus died in A.D. 10, not in A.D. 14. Second, the failure to recognize the antedating of Tiberius Caesar's reign by 10 years, such that his reign began in A.D. 1 and ended with his death in A.D. 22. These two chronological errors place events after Tiberius Caesar's death about 14 years earlier than has been generally accepted by historians and chronologists. Regardless if you accept the 56 AD or 70 AD date of the destruction of the 2nd Temple, one cannot escape the key wording Daniel's 9:24 prophecy clearly states: "To finish the transgression, To make an end of sins, To make reconciliation for iniquity, To bring in everlasting righteousness, To seal up vision and prophecy" can ONLY APPLY at the completion of the 7th millenium when ALL IS FULFILLED - it is plainly obvious that what Daniel has stated has not remotely taken place. This clearly and obviously DID NOT happen during or after 56 AD or 70 AD. Considering God’s Master Plan for planet Earth witnessed thru His 7 Biblical Feasts (here), the most important event to occur during Earth’s seventh 1,000 year period will be the millennial reign of Christ with all the resurrected saints. This period begin after Christ 2nd Coming to Earth, during Earth’s 6,000th year, and Satan is locked up in the bottomless pit. Thereafter the 7th Millenia (70 weeks) New Covenant begins with the Chosen of Israel when God Elohim place HIS LAW in their hearts (Jer 31:31-34). Then and only then is when there is a finish of transgression, an end of sins, a reconciliation for iniquity, everlasting righteousness, and to seal up the vision and prophecy that fittingly ties in with God's sacred 7th day of rest Sabbath. Fulfilled! Daniel 9:24 Commentary: The Meaning of the Seventy Sevens of Daniel 9:24 . . . The units used in this chapter are Jewish years. Therefore, the sevens in this verse are seven Hebrew years. Ancient Israelites charted time with two separate calendars, one dictated by the moon’s rotation around the earth and the other by the earth’s rotation around the sun. The months of the lunar year alternate between twenty-nine and thirty days with twelve months in a year. Thus each year averaged 354 days. In order to prevent seasonal overlap, approximately every three years another month was added to the calendar. The Israelites also appeared to have used another slightly more accurate calendar. This solar calendar had twelve months each with thirty days for a total of 360 days in a year. This 360 day solar calendar is sometimes called the prophetic calendar because of it’s occasional implicit appearance in the Bible (Genesis 7:11,24; 8:3-4; Daniel 7:25; Revelation 11:2-3; 12:6; 13:5-7). This 360 day solar calendar year was also used in ancient Egypt and Babylon, two countries in which Jews spent considerable time. It seems that the Hebrews may have adopted this calendar from Egypt or possibly earlier from Abraham who was from Ur of the Chaldees. Perhaps its sparing use among the Hebrews was somewhat recharged while the Jewish exiles were in Babylon? (Recall that Daniel wrote this chapter as a Israelite exile in Babylon. Coincidence?) As will be shown shortly, Daniel is about to use both of these calendars in order to predict the exact year in which God would forgive the sins of the world. Velázquez, Diego. Cristo de San Plácido. Museo del Prado. According to Leviticus 25:40 after every forty-nine years, the Hebrew people were to celebrate a Year of Jubilee. This year was to be announced on the tenth day of the seventh month. 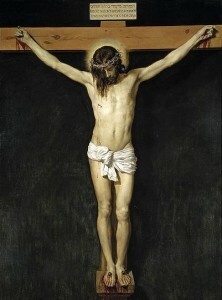 This was the Day of Atonement. It was only on this day of the year that the high priest was allowed to enter the Holy of Holies. Once inside, the high priest would sprinkle the blood of a goat and a bull inside the Most Holy Place. This was done as an offering for the sins of Israel (Leviticus 16, Exodus 29). This act would announce the fiftieth year, also known as the Year of Jubilee. During this year, all debts were to be cancelled (Leviticus 25:8-17). The 70 sevens or 490 years are ten Year of Jubilee’s. According to this verse, on the tenth and final Year of Jubilee, God would cancel mankind’s debt of sin, forgiving his people forever. Therefore there are to be 475 years from the decree to rebuild Jerusalem in 444 B.C. until the high priest was to make his final acceptable sacrifice on the Day of Atonement. 475 years – 444 B.C. = A.D. 31. Thus A.D. 32 is the final year in which God would honor the blood of bulls and goats as a sin offering. This would be the final year in which “your people [the Jews] and your holy city [Jerusalem]” were “to atone for wickedness.” As stated earlier, after every 7 X 7 or 49 years there was to be a Year of Jubilee in which all debts were to be cancelled and all slaves were to be set free. The Year of Jubilee began on the fiftieth year. Therefore the next year, A.D. 33, was the tenth and final Year of Jubilee. On this special Year of Jubilee, God finally “set the captives free,” canceling the debt of sin that had enslaved humanity since the time of Adam. Scott, William Bell. The Rending of the Veil. 1869. What is meant by “anoint the most holy” in v. 24? Because of differences in Daniel 9:24 between various ancient manuscripts there is some debate as to whether what is anointed in Daniel 9:24 is a person, the Messiah, or a place, the Holy of Holies of the Temple. And because of these notable discrepancies in ancient manuscripts some translations of the Bible translate v. 24 in order to suggest that what is anointed is a person and some translate v. 24 so as to refer to Holy of Holies of the Temple. [6a] It seems that either translation, however, works well. According to v. 24, after the high priest had offered the last acceptable animal sacrifice for sin in A.D. 32, a new high priest was to be anointed. 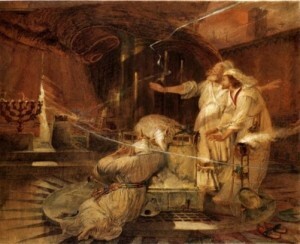 The first high priest, Aaron, was anointed with oil before he began his ministry (Exodus 29:1-7). This oil symbolizes the Holy Spirit. Having been anointed with the Holy Spirit (Luke 3:22), Jesus, the new high priest, offered his own blood as a sin offering in A.D. 33, the tenth and final Year of Jubilee. According to the Gospel accounts, immediately after Jesus’ breathed his last, the curtain blocking the entrance to the Most Holy Place was torn (Matthew 27:51). The fact that the curtain had been torn is a sign that Jesus had entered the Most Holy Place something only the high priest was allowed to do (Hebrews 9:7). Having entered the Holy of Holies, Jesus offered his own blood as a permanent sacrifice, one that would not have to be repeated year after year. "Seventy weeks are determined For your people and for your holy city, To finish the transgression, To make an end of sins, To make reconciliation for iniquity, To bring in everlasting righteousness, To seal up vision and prophecy and to anoint the Most Holy Place." 5. Vision and Prophecy WERE NOT SEALED in 33 AD - the Vision and Prophecy of both Christ and John were yet to follow in the Book of Revelation and in addition, Christ's fulfillment of the Law of Moses, the Prophets, and Psalms CANNOT be fulfilled until His 2nd Coming. HOLY PLACE (6944. qodesh http://biblehub.com/hebrew/6944.htm ) and SANCTUARY (4720. miqdash or miqqedash http://biblehub.com/hebrew/4720.htm) and TEMPLE (3485. naos http://biblehub.com/greek/3485.htm) ARE THE SAME THING. 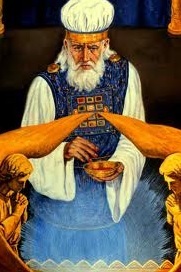 "Behold, days are coming," declares the LORD, "when I will make a new covenant with the house of Israel and with the house of Judah, not like the covenant which I made with their fathers in the day I took them by the hand to bring them out of the land of Egypt, My covenant which they broke, although I was a husband to them," declares the LORD. 33"But this is the covenant which I will make with the house of Israel after those days," declares the LORD,"I will put MY LAW within them and on their heart I will write it; and I will be their God, and they shall be My people.34"They will not teach again, each man his neighbor and each man his brother, saying, 'Know the LORD,' for they will all know Me, from the least of them to the greatest of them," declares the LORD, "for I will forgive their iniquity, and their sin I will remember no more." The above scriptureS CAN ONLY APPLY at the outset of the 7 Millenium - then, and only then DO ALL of the above 6 pts apply and line up to Daniel's 9:24 Prophecy in the future. Daniel 9:25 states: "Know therefore and understand, that from the going forth of the commandment to restore and to build Jerusalem unto the Messiah the Prince shall be seven weeks, and threescore and two weeks: the street shall be built again, and the wall, even in troublous times." According to the Bible, when the Jewish exiles returned to Jerusalem following a DECREE from Cyrus the Great (Ezra 1:1-4, 2 Chron 36:22-23), CONSTRUCTION STARTED at the original site of Solomon's Temple, which had remained a devastated heap during the APPROXIMATELY 70 YEARS OF CAPTIVITY (Dan. 9:1-2). After a relatively BRIEF HALT DUE TO OPPOSITION FROM PEOPLES who had filled the vacuum during the Jewish captivity (Ezra 4), work resumed c. 521 BCE under Darius the Great (Ezra 5) and was completed during the sixth year of his reign (c. 516 BCE), with the temple dedication taking place the following year. The “approximate” period of 70 years of captivity matches with the 69 years Daniel prophesied when you account for shorter Hebrew calendar years. This historical data matches up with the account of Daniel’s wording identically as well. Daniel 9:26 states: "After the sixty-two 'sevens,' the Anointed One will be put to death and will have nothing." After the 2nd Temple is built the Messiah will be killed – then Roman Emperor Titus and his Roman army destroyed the city and the sanctuary (Temple) (depending on your source, either in 56AD or 70AD) bringing war and desolation (diaspora) of the children of Israel. The Messiah is obviously not put to death at His 2nd Coming - He was and could only have been put to death at His 1st Coming so this very clearly cannot be a future End Time event - it has happened. Daniel 9:27 states: "The ruler will make a treaty with the people for a period of one set of seven..."Who is the "ruler"? God Elohim what "treaty or covenant for a period of one set of seven" is Daniel referring to? The seven (7) Biblical Feasts that God Elohim created with His Chosen of Israel that apply and are in effect for the 7 millenium period UNTIL ALL IS FULFILLED. "and on the wing of abominations will come one who makes desolate, even until a complete destruction, ONE THAT IS DECREED, is poured out on the one who makes desolate." The destruction of the Temple did not DECREE anything. The Jerusalem Council led by Lawless preaching Pharisee Paul in 49 AD (7 WEEKS) DECREED the end of the Law of Moses that led to Lawless Christianity which deceives the world. The ABOMINATION who stands in the Holy Place (Matt 24:15) WILL BE the Lawless AntiChrist "Pope" (https://israelinewslive.org/pope-francis-fulfills-biblical-prophecy/) whose official origin traces back DIRECTLY to THE ABOMINATION THAT DESOLATED GOD'S CHOSEN by THE DECREE Paul established at the Jerusalem Council AGAINST GOD'S ETERNAL LAW which connects His Chosen to Him that is to be kept FOREVER (Isaiah 40:8) for ALL GENERATIONS by both Hebrew Israelites AND Gentiles (Exodus 12:49, Leviticus 24:22, Numbers 9:14, Numbers 15:29) until the first heaven and earth pass away (Lk 16:17, Matthew 5:18). God DOES NOT change His mind nor is a liar (1 Samuel 15:29 & Numbers 23:19). As noted in great detail how the Messiah’s death put an end to the sacrifices in the middle of the 7 (“week”) Biblical Feasts period (here) which thereafter was followed by the Jerusalem Council in 49 AD that brought about the DECREE of Abomination (i.e., Lawlessness) poured out (preached) by Pharisee Paul who brought about Desolation to the children of Israel from their God Elohim.
" And on the wing of abominations shall be one who makes desolate, Even until the consummation, which is determined, Is poured out on the desolate." Who is the "one who makes desolate"? For those Chosen of Israel who persevere - not falling for the deception by Luciferian Paul that God's Law is no longer required to keep - God Elohim's LAW will be placed in their hearts when He establishes His New Covenant in the Kingdom of Heaven FOR ETERNITY (Jeremiah 31:31-34, Micah 4:1-4). Daniel's 1290 day prophecy: The Matthew 24:15 scripture does not connect to the Daniel 9:25-27 prophecy but rather to the Daniel 12:9-13 1290 day Abomination of Desolation prophecy which is sealed UNTIL THE TIME OF THE END - this obviously has not taken place yet. The Mt 24:21-22/Dan 12:11 scripture ties in with the renewal of the "regular sacrifices" that will be re-instituted at the soon completed 3rd Temple in Jerusalem: https://www.templeinstitute.org & https://www.breakingisraelnews.com/tag/third-temple/ EYES WIDE OPEN - SHALOM !